After a tease last week, Red Giant has taken the wraps off of Universe and launched a public beta of the new community centered around editing and filmmaking plug-ins and tools. It’s free to become a member of Universe and many of the plug-ins are available for free as well. If you want access to the premium tools, you have to pay a subscription fee of $10/mo or $99/year, which is becoming more and more of a theme in the software community. However, unlike Adobe’s Creative Cloud, Red Giant offers a lifetime subscription that can be purchased with a one-time fee of $399. The lifetime subscription option should alleviate concerns that many people had with Adobe Creative Cloud. Essentially, you are purchasing a perpetual license for the Universe premium plug-ins and any other premium plug-ins that come out at a later date. 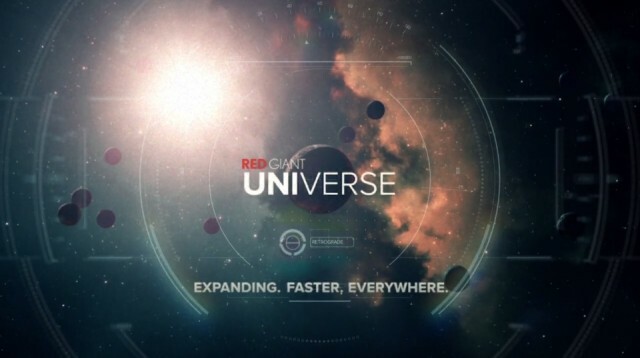 Red Giant Universe is launching with 50 new free and premium tools that work with multiple host applications. Every tool in the Universe library of effects and transitions is GPU-accelerated, both Mac and Windows compatible, and works across multiple host applications including: After Effects, Premiere Pro, Final Cut Pro X and Motion. The Universe library of tools is continuously growing—new effects and transitions are added regularly, and existing tools are updated often, based on user feedback. In addition to the expanding library of free plug-ins, Universe also offers Premium membership, which gives users access to even more tools – including new effects and transitions, as well as existing Red Giant favorites ported over to the new Universe platform (such as Knoll Light Factory EZ, Holomatrix, Retrograde, and ToonIt). In addition to the plug-ins that Red Giant kicks out, Universe Labs allows members to help choose what effects and transitions Red Giant builds next. And, premium members will be eligible for invitations to early betas of new products. Here’s a BTS look at Red Giant Universe and how they piece together plug-ins on the fly. Check out all the details over at RedGiant.com/Universe.